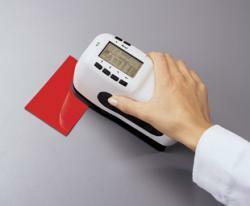 The SP64 Portable Sphere Spectrophotometer is a versatile instrument designed to provide fast, precise color measurement information on a wide range of materials such as paper, paint, plastics, and textiles. Absolute and difference measurements are obtained for the following colorimetric systems: CIE XYZ, CIE Yxy, CIE L*a*b*, Hunter Lab, CIE L*c*hÂ°, CMC, CIE94, Whiteness and Yellowness per ASTM E313-98, Metamerism Index and DIN 6172 + AATCC Gray Scale. Â·Versatile use for lab, plant or field operation. Â·Easy to read, large graphical LCD display. Â·Permits quick measurement and comparison of two colors without need to create tolerances or store data. Â·Multiple color standards can be collected under an identified project as part of corporate color standards programs. Â·A programmed sequence of specific steps guides an operator through a color measurement process, assuring consistency. Â·The internal apertures can be quickly changed with the flip of the switch for 4mm to 8mm aperture sizes. Â·Up to 1,024 standards with tolerances can be stored for easy pass/fail measurement. Â·Excellent compatibility of different color control instruments ensures better data integrity. Â·Device measures opacity and color strength in chromatic, apparent, and tri-stimulus calculations as well as 555 shades sorting for precise color control of products involving plastic, painted, or textile materials. Â·Simultaneous measurement of both specular-included (color) and specular-excluded (appearance) in order to determine the influence of the specular component. Â·Flip-back target shoe for flexible use in difficult positions. Â·Rechargeable battery operation allows measurements in distance to the PC..